Confession time. I have a box of photos under my bed. I know, it’s terrible, right? Several years’ worth of photos stuck in a box, and no one is able to enjoy them. I decided this was going to be the year that I finally got them organized. Do you have this same dilemma? Are you ready to finally organize your photos? I can’t remember a time when I wasn’t fascinated with photography. As a little girl, I would sit for hours and look at our family photo albums. When I started my own family, photos were still an important part of my life. I took many photos of my children! For awhile, I tried to create scrapbooks to store our photos. But as the babies kept coming and life got crazy-busy, I realized that scrapbooking wasn’t practical for me. Photos, stickers, papers, and adhesives cluttered up our small craft area. And the photos began to pile up in a box. As I abandoned scrapbooks, I looked for a simpler method of photo organization. I bought cheap magnetic albums and stuck all the photos in there. It was fast, but after a few years, the pages yellowed. Next, I tried Project Life albums. It seemed simple enough. But getting all the photos printed was my struggle with this method. And there was still too much clutter. I decided to try digital scrapbooking. It seemed like the perfect clutter-free solution! I thought viewing my photos on a screen would be better than nothing. But it just didn’t feel right to me. I wanted to be able to pull out a book, cuddle up on the couch, and flip through our family memories. I just couldn’t get that feel from viewing them on a screen. After a bit of searching, I finally discovered my solution. Photo books. They’re simple to create, they look beautiful, and you can fit a whole year in one book. I’m in love! I created this photo book in four days, during our Christmas break. I don’t recommend doing it this way (in a rush), but I really wanted to get this done. On December 31st, I uploaded my 294 page photo book to Blurb. I chose Blurb because they don’t limit the number of pages you can have, and their books are very high-quality. It was such an amazing feeling to check off one of my goals before the new year even started. I’ve made other photo books through the years, but they were smaller books covering just one event or a few months. When I set out to organize the whole year into a book, it felt like a massive undertaking. But it was actually very doable. Below, I’ll share some tips to make the process easier. If you’re organizing digital photos, it helps if you have them in folders on your computer. I have a folder for the year, and within that folder I create monthly folders. 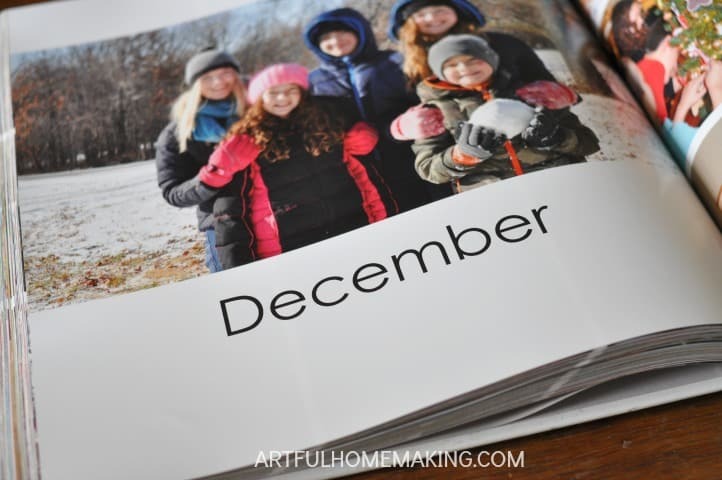 This makes it easy to grab the photos for a particular month and drop them into my photo book. If you’re working with printed photos, I would suggest separating them out by date. If you plan to put them in a bound book, they’ll need to be scanned in first. Eventually, I’d like to scan in all of our older photos (the best ones) and make photo books with them. 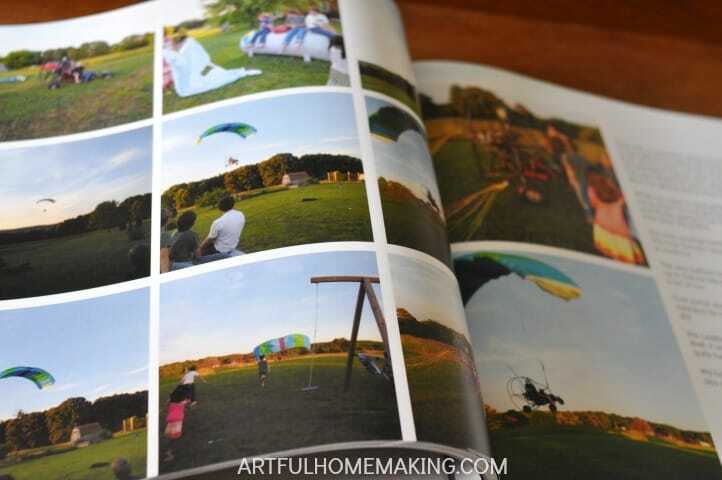 To make a large photo book, you’ll want to download Blurb’s BookWright program. With BookWright, you can work on your photo book even when you’re offline, and you won’t be limited on the number of pages. My completed family yearbook was almost 300 pages! This software is wonderful to work with! It comes with a variety of templates and fonts to choose from. You can also save your favorite layouts and then it’s a simple matter to add them where you want them. Add photos to your pages by dragging them into your layout. My book had well over a thousand photos at last count. I’m not sure how many it ended up having, but let’s just say it was a lot. Maybe even close to 2,000. I used a combination of DSLR photos and phone pics. Surprisingly, the phone pics worked just fine in most cases. The Blurb layouts let you choose how much text you want to add. 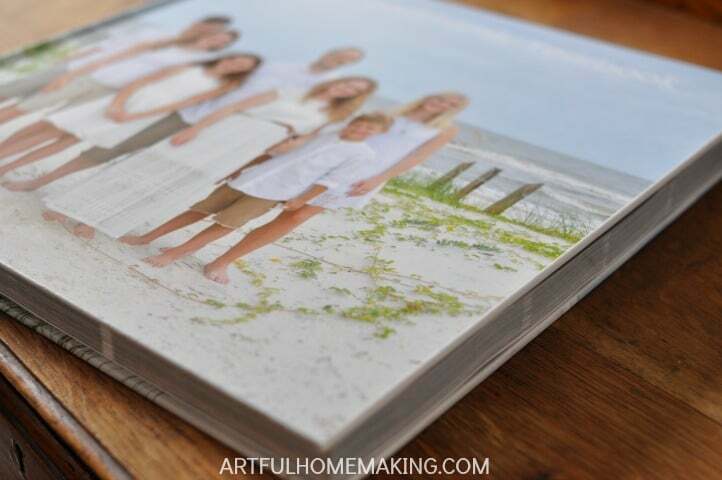 You can truly make this a family heirloom and tell your story on the pages, interspersed with photos. My book is mostly photos, but I did include some writing here and there. I wrote an author introduction at the beginning of my book, and I tried to include a paragraph or two for each month, detailing the highlights for that month. I also wrote a final paragraph on the last page. To make sure you don’t end up with typos or mistakes, be sure to edit your book before you upload it! The final step is to upload your book to Blurb. Depending on the size of your book and the speed of your Internet, this can take hours. I think mine took about three hours or so. As you can imagine, a book this size wasn’t cheap. A generous family member gave me some money for Christmas, and that’s what I used the money on. I think the sticker shock comes from having to pay the whole price upfront. If you ordered 2,000 photos from a photo printing service, bought scrapbook binders or photo albums, adhesive, stickers, etc., you would actually be spending more than what I spent on my book. It just feels different because you’re buying those things a little bit at a time rather than all at once. So, while some may not feel it’s worth the money to make a book like this, for me it’s totally worth it. Pictures are important to me, and it gives me such a feeling of satisfaction to have a whole year organized into a book. Somehow it helps bring closure to the year. I also love the fact that if we ever had a fire or something, I could always reorder my book from Blurb. It’s kind of like additional photo insurance for me. Was it worth it? Definitely! I’m already working on my next one. My goal is to have Blurb books for all of our photos eventually. My plan is to work backwards and also stay current with this year’s photos. So, I’m working on a 2015 book and also starting 2017 soon. In our digital age, so many of us are storing photos digitally. Which means they never get printed at all. They live on a storage device or on our computers, unable to be enjoyed by the family. I’m loving the way our Blurb photo book allows us to relive last year’s memories! Can you bottomline it and give us a price?! I have 6dc ages 29 – 12 and haven’t put any in books! I have started separating pics in a photo box for each of them and I do have loose pics stored by year. I would love to make a book for each of them and then a family album for me. Did you find that scanned pic quality was good? Oh my goodness this is brilliant! I totally have to check that out.. I have bins and bins filled with pictures we’ve accumulated through the years. This was very helpful! So glad it was helpful, Jasmine! 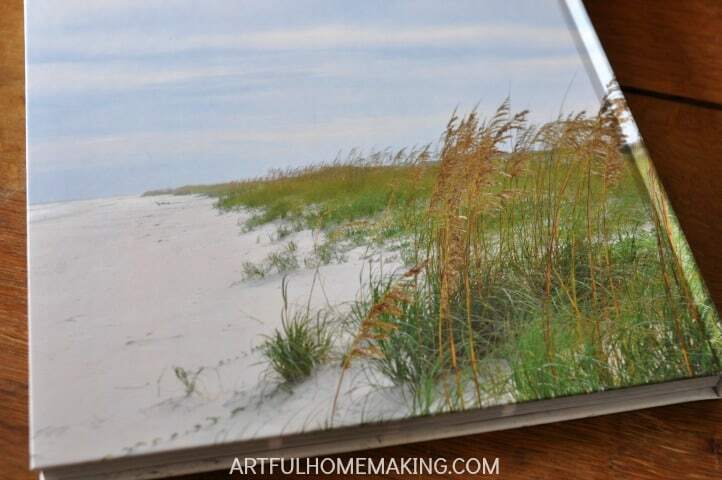 I have been using Walmart’s photo books (because they are cheap), but I am going to have to give Blurb a try! Thanks for sharing on the Homestead Blog Hop! I know, I’ve used other companies before, but they always limit the number of pages I can do. I love that Blurb lets you make it as big as you want! Thanks so much for stopping by, Jessica! Wow! I love this! I have made several photo books before and love them!!!! I gave up on scrapbooking a long time ago. It takes so much time and I’m so busy! I’ve never done a whole year though! I need to! I have one for the first month of each of my babies and our wedding and some other special occasions. I did create some books for a family member’s daughters who’s father passed away. Those were huge documenting his whole life! I’ve also done several smaller books, but this was my first time to get a whole year in one! I can imagine that documenting a life in a photo book would be quite a feat! What a special heirloom that must have been for them! This post is perfect timing! I am actually uploading photos this very moment for the first time in over a year! I love this idea, Joy! I am going to be doing this for sure! Thank-you for the idea and the link! Elizabeth is getting ready to have her 1st birthday and I still haven’t even developed her newborn pics! I think I have about 1,500 to upload, which is going to take forever to upload it, but like you said, it is sooooo worth it and a family heirloom to look back on! I still can’t believe we haven’t met Elizabeth in person and it’s already been a year!! Hopefully one of these days we can get together. Yes, I think you and I are similar in our love of photos, so you’ll end up with a big book also. 🙂 But it’s totally worth it! Wow! What a great idea!!! I too struggle with the fact that most of my photos are now stored on my computer or on an external harddrive, which is scary in and of itself because things can go wrong and I would be devastated to lose family pictures. I never thought of making a picture book. I am sure it is costly, but what an amazing heirloom to leave behind. I often say to my husband with this whole digital age, what will happen to museums centuries from now. There won’t be tangible items to see and hold. Will we just sit in front of a computer screen to look at history. How boring. I’m so glad I stopped by here today. Thanks for sharing! I love to make photo books. 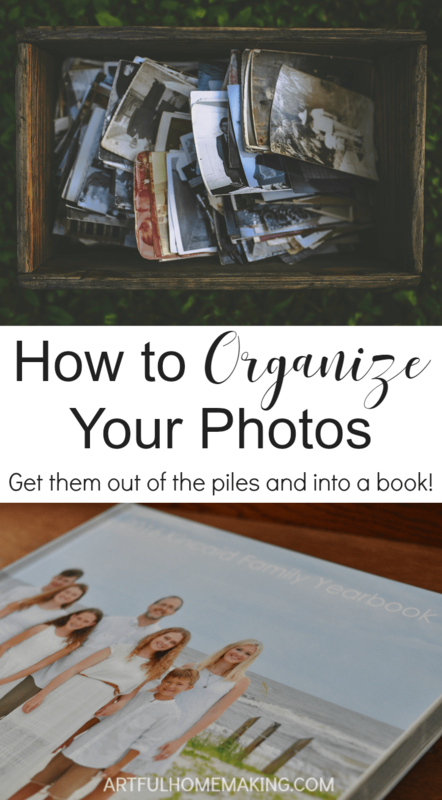 It’s the perfect way to save and organize photos! I agree, they’re the best! Blessings to you, Patty! A book like yours is the sweetest idea to remember some precious moments ! Thank you, Franca! Hope you have a great day!